Written by andy bartotto on Tuesday, August 2nd, 2016 at 9:34am. Blink-182 returned to their old San Diego stomping grounds for a show with The All-American Rejects and A Day to Remember. The evening started off on the right note with The All-American Rejects. Their set included such favorites as “Give You Hell” and “Dirty Little Secrets.” Their set lighting was dark, especially for an arena show. Lead singer Tyson Ritter is usually in the spotlight, but this time he was in the dark, for the most part, while his bandmates Nick Wheeler, Mike Kennerty, Chris Gaylor, and Scott Chesak were properly lit. From time to time you’re lucky enough to catch a band in a supporting role that you’ll add to your “must see again” list. A Day to Remember fit that bill, especially with singer Jeremy McKinnon’s great stage presence. McKinnon worked the crowd and provided some great photo-worthy moments. With A Day to Remember’s latest album Bad Vibrations due out this September, hopefully we’ll be lucky enough to have them come back to town to headline their own show. 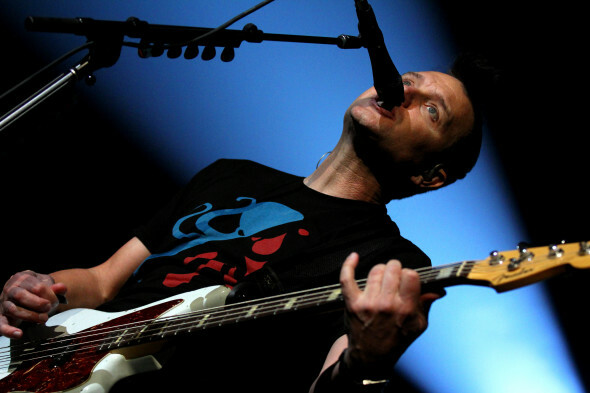 Night two of Blink-182’s homecoming at San Diego State’s Viejas Arena, in support of their latest album California, proved that they are ready to rock arenas across America once again. With newcomer Matt Skiba (Akaline Trio, The Sekrets, The Hell) filling in for longtime member Tom DeLonge, Mark Hoppus and Travis Barker kicked off the night with “Feeling This” from their 2003 self-titled album. “What’s My Age Again?” is perhaps their most timeless song, sounding as great now as it did when it was released in 1999. Perhaps this will be one of those rare times when a new member will revitalize Blink-182 and breathe new life into a band that has been around in various iterations since 1992.